This effective frame has an enamel effect finish in a lovely pale cream and is accentuated by a line of tiny diamante gems, dotted around the edge of the aperture which are mounted into the silver band. 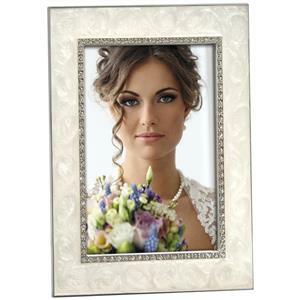 This double shine effect, draws the eye to the photograph inside, which is slipped into the frame from the back. The silver edge of the frame mirrors the internal silver band and the Botticelli frame has a strong velevet clad strut on the back. It can stand either vertically, or horizontally and measures approximately 6.75 x 4.25 inches overall.